Last month, Neil Young was supposed to induct Pearl Jam into The Rock and Roll Hall of Fame, however he fell ill (fortunately, "nothing major"), so David Letterman performed the induction honors instead. As Neil Young’s self imposed 2017 sabbatical continues, we know that creativity never sleeps. So at long last, Neil Young has emerged in public at a Willie Nelson concert at the Stagecoach Country Music Festival in Indio on Saturday, April 29. 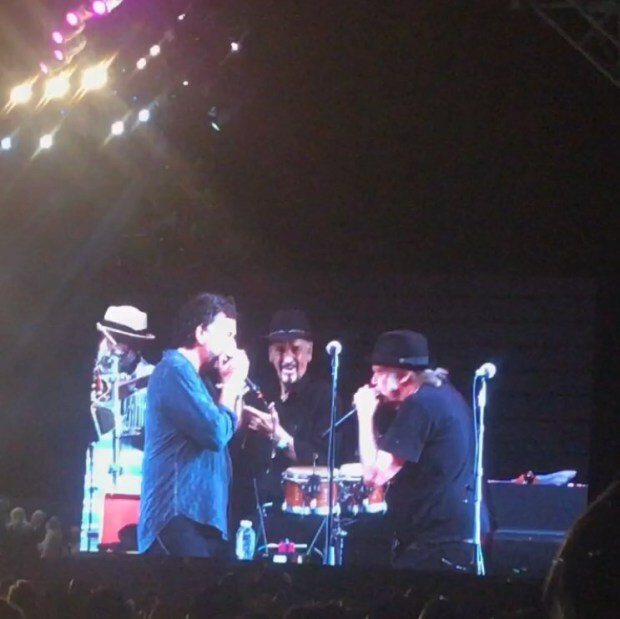 It was Willie Nelson's 84th birthday and he led the crowd in singing “Happy Birthday” during which Neil Young joined in on the harmonica. In other Neil Young sabbatical news, we've also learned that he is co-starring with Daryl Hannah in a film described as a “post-apocalyptic western fantasy musical.” This report comes from cinematographer Adam Vollick who is working on the film. So -- just to clarify -- while we call 2017 a "sabbatical year", so far it only applies to touring. Clearly, Neil is still young and restless at heart. In other Neil Young sabbatical news, we've also learned that he is co-starring with Daryl Hannah in a film described as a “post-apocalyptic western fantasy musical -oh dear that'll make a big splash. A man needs a mermaid. A Rustie needs a new joke. Currently on offer on eBay is a gatefold vinyl On The Beach. Apparently withdrawn after release the inner gatefold is the glorious floral design printed on the inside of the cover on standard copies. Quite rare I imagine. Not something I!ve seen before. Off topic I know but I!m having a sabbatical. Black Sabbatical - Ozzy Osbourne goes on holidays. Oh dear god...please no! Just don't do it...Neil. Haha Neil being Neil. Starring in a film with Daryl. Oh dear. In other sabbatical news, the two original release series CD box sets have been delayed until late June. We must wait just a bit longer for Time Fades Away on CD. ....and it's good to see both Willie & Neil are feeling better. Well, judging by the reaction here, many are more intrigued by the filming than Neil's "recovery". Any word on whether Daryl wants a release of Archives II? We all know that sooner or later....it all gets real. Doesn't it? Crosby was in town last night. I stayed home and watched the CSNY "Deja Vu" film. It was fun watching all the pissed off fans. Homestead was released on the Hawks and Doves album in 1980. But I read somewhere Neil said that song had been around for a while. So my guess is between 1975 - 1980. I'd say closer to '75. Of course, deeper research would probably find an exact date. on some great material yet to be released. I think of him as an old friend who used to always make me wait. "Old Homestead" was recorded in January 1975 toward the end of the "Homegrown" sessions (after being debuted live during the CSNY tour in 1974). "Danger Bird" is from July 1975; the "Zuma" cover artist, James Mazzeo, says in "Shakey" that "Neil told me some images he had in his mind of birds flying women over the desert, pyramids and stuff." Many many thanks to Arthur and Babbo B. The Old Homestead was recorded at the Quadrafonic Sound Studios, Nashville on 8th December 1974. Indirectly related, here's a great live compilation from 1976 showing vintage solo Neil and some great Crazy Horse work including the new guy Poncho. Side two: the losing end, last trip to Tulsa (electric), don't cry no tears, it' is gonna take a lot of love, hurricane. I previously owned this bootleg. The record was red and the show was Hamburg 1976. Many Tks Babbo B. and the Rider! Re: The Movie... Do I smell Human Highway Revisited? Long and short, there's nothing new in Neil doing eccentric movies, and I have a feeling this will be another of those novel items pulled out of the attic occasionally by absolutely incurable Neil-maniacs (like me) just to make sure it hasn't gone any less bizarre and unapproachable. In other words, a curio for the devotee but most people will never see it. Which is fine with me. It's not even like there's anything left to prove at this point in Neil's career. Let him grow old and wear purple gloves, as it were. Clarification: My mind got muddled a little with the "purple gloves" bit, but here's what I was thinking of: https://www.poemhunter.com/poem/warning/. I got two lines of the poem confused in my memory. Still, kind of describes the time of life Neil may be entering.